In a medium size sauce pan, bring juice to a boil, add apricots, reduce heat, cover and simmer for 5 minutes. Stir apricots and repeat this step. Remove the pan from heat, stir, cover for additional 20 minutes. When apricots are soft and plump, remove them from pan with slotted spoon. Reserve any left over juice for pears. Puree the apricots in a food processor until they become a smooth paste. Set aside. Mix dry ingredients in a medium size bowl. Make a well in the middle of the dry ingredients. Add safflower oil, rice nectar and 1 tablespoon water. Combine all the ingredients thoroughly. If mixture is dry add more water. Do not over mix dough. Remove 1/2 cup flour mixture for sides of crust. Form remaining flour mixture into a ball, wrap and refrigerate for 30 minutes. Cover loose flour mixture and refrigerate. Pre-heat oven to 350 degrees. Lightly oil a 9 inch tart pan with removable bottom. Lightly flour the dough on both sides. Roll the dough out between two pieces of parchment paper into a 9 inch circle. Remove the top sheet of paper, place the round removable bottom of the tart pan on top of the rolled out crust and flip. Place this inside the tart pan ring. Finish crust by distributing the reserved ½ cup of dough around the edges and up the side about 1/2 way, pressing firmly. Place tart pan on a cookie sheet. Bake for 12 minutes. Remove tart pan from the oven while it is still on the cookie sheet. When crust is still slightly warm, evenly spread the apricot paste covering entire bottom of the almond crust. Wet fingers to press the paste in place. When completely cool, remove the ring from the tart pan and carfully slide the tart onto a serving plate. Slice each pear quarter lengthwise into 3 pieces. Add any leftover juice from cooking apricots to the pineapple juice. Add stevia. In a medium size saute pan, bring the juice to a boil and add pear slices. Cover, lower temperature and simmer for about 2 minutes. Uncover pan and carefully baste pears with juice. Remove pears to a plate with slotted spoon leaving all the juice in pan to reduce to about 3 tablespoons of liquid. Add nutmeg. Turn off heat and stir in jam, breaking up any pieces of fruit with a fork. 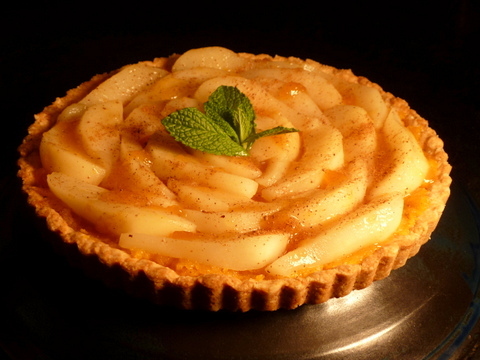 To finish the tart, lay the pear slices in circular formation on the apricot puree, starting at the outside. Spoon the jam mixture evenly over the pears. Cool to set. This tart is best when eaten the day it has been made.